Kudos has long been known for making some of the classier speaker stands around. The company was taken over by Neat Acoustics a few years back, but has become an independent entity again and is now headed by ex-Neat designer Derek Gilligan. Making its debut at one of last Autumn's London hi-fi shows, the rejuvenated Kudos brand was demonstrating an all-new Cardea range of four loudspeakers and some very attractive modular equipment racks, in addition to the speaker stands. The Cardea range comprises two standmounts (C1, C10) and two floorstanders (C2, C20). Between them, the four mix'n'match two main drivers, two tweeters and two enclosures. As such, this C10 standmount uses ingredients of the very finest quality in order to justify its substantial £2,200 per pair price. Understated restraint is very much the watchword here. The UK-built, 12 litre reflex-ported enclosure is made from 18mm MDF, damped internally and handsomely finished in a selection of real wood veneers - ours came in walnut, while cherry, sycamore and rosenut are the other options. Both drivers are flush mounted into the front, while the optional grille uses hidden magnets instead of unsightly mounting lugs. The drivers are sourced from Norwegian specialist SEAS, and the tweeter used here is its top model, the very costly Crescendo, a 29mm fabric dome driven from a six magnet array and with a moulded alloy back chamber. 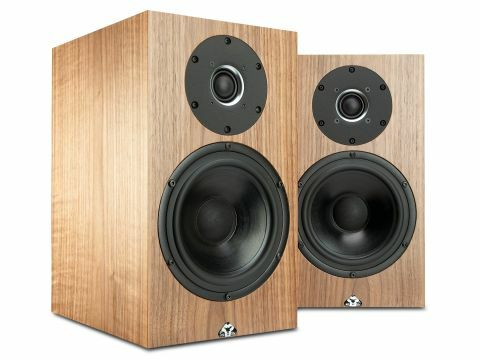 This tweeter accounts for much of the C10's £900 price premium over the C1. The bass driver has a 180mm frame and a 120mm doped paper cone. The Chord Company cables are used internally, and the hardwired first/ second-order crossover uses silver-wired Clarity Caps. Twin terminal pairs provide a useful bi-wire or bi-amp option, and are mounted on a solid recessed board, and come supplied with high-quality wire links. The bass alignment didn't prove ideal for our listening room, as the port is tuned to 48Hz, which is very close to a major room mode. Best results were obtained with the speakers well clear of boundary walls, to avoid overemphasising the 50Hz zone. This is not a dramatically exciting speaker, but it is beautifully subtle, in the sort of understated and delicate way that reflects the way it is built and presented. There's certainly some lack of authority and warmth, and a little more 'punch' would also be welcome, but the midrange and top end is where the C10 promises much, and also where it also undoubtedly delivers. One talks about the sound of tweeters, but the ideal tweeter is one that isn't actually audible, as a separate entity, that is. It needs to make its contribution by adding harmonic structure to musical instruments and notes that bring openness and realism to the sound. But it should also integrate perfectly, drawing as little attention to itself as possible. That's very much the case with this tweeter. There's plenty of treble output here, but it remains remarkably clean and well integrated, delivering loads of subtle detail with impressive all round coherence, and making others sound crude by comparison. Midband colorations and boxiness are both well controlled, ensuring the excellent imaging that is characteristic of a high quality standmount. The Kudos C10 is undoubtedly a class act, hampered only by the high price and limited bass authority typical of a small, well-designed speaker.